Friday evening had been a Tanglewood washout. Not in the wet way one might expect in Lenox; rather, a night that should have glittered with luxurious early German Romanticism became sleepy and mired in Ken-David Masur’s sluggish tempi and prosaic gestures. Schubert’s ‘Tragic’ was, that night, only too much so, and not in the indulgent sense. Garrick Ohlsson played the ‘Emperor’ deliciously, but with restraint; on our blanket, there was a consensus of commiseration and the feeling he was a rose amongst thorns. So, before Saturday’s performance, all enthusiasm was in abeyance. We should have known that Andris Nelsons (our hero!) would never let us down, but we settled into our slatted seats limply and with modest expectation. We now see that Friday had been a preparation, as it set Nelsons’ verve in sharp relief, and left us empty to have our spirits fully replenished; Nelsons brought to Saturday’s program of Beethoven and Shostakovich the starlight sparkle that had been conspicuously absent on Friday. The Beethoven Triple Concerto in C Major is notable for its wit, invention and novelty of texture; to contextualize it in 1804 only emphasizes its cleverness and avant garde creativity—chamber groups with ripieno were, of course, a staple of the Baroque, but much less typical in the early days of the 19th-century concerto. Beethoven’s cello and violin parts are extremely virtuosic and originally designed for the excellent court players Seidler and Kraft, while the piano part was conceived for Archduke Rudolph of Austria, an enthusiastic and competent amateur, and Beethoven’s pupil patron; it was “celebrity” vanity performance at its courtly best, and it seemed as if Thibaudet and the Brothers Capuçon had been type-cast for their according glamor. In this piece, Beethoven treats larger-than-life themes with his characteristic simplicity and strength, never a note without reason; the muscular virtuosity of the performance and the manly good humor of the trio’s interplay and cerebral interpretative playfulness elicited freshness from the score and delight from the audience. It was clear from the outset of the Allegro that there was enormous musical camaraderie among the soloists, the orchestra, and Nelsons—an easy, ready currency of grins, chuckles, and gestural nuance. The brothers Capuçon are amazingly facile, dextrous musicians, and were wholly in sympathy in terms of phrasing, rubato and gesture. Renaud released his bow more extravagantly at the end of flourishes, while Gautier was slightly more understated (and perhaps for this the more captivating). He plays with an unusually open-faced cello angle which sings out across the orchestra (especially in the opening themes of the first and second movements), playing to the Shed’s difficult acoustic with skill and assurance; he balanced the soloists, acting as a generously broad bridge of communication between violin and piano. Thibaudet bore himself with his eminent distinction, and entered into the Ducal character satirically and with winning, hilarious self-deprecation. He delivered his octave themes with a posturedly noble air, with a deliberate projection of the naive. He seemed at pains not to dominate in the way he can as solo pianist; he exuded eminence of birth and he pantomimed august peerings at the score. He brought a sense of the context of the work’s composition and reception to its realization, whilst not letting us forget that he is a great modern virtuoso. Always polished, the orchestral playing seemed immeasurably more jovial than on the previous evening. Even when the audience is offered the flat of the Maestro’s back debonairly propped against the rostrum, Nelson’s smile still feels visible. His technique is enabling and encouraging, and he has the grace to place himself at the service of his soloists, making himself in turns inconspicuous and commandingly present as best served them. The pianissimos from the strings in the Beethoven were utterly gripping, with Nelsons seemingly diving forward into the violins, grabbing every intensity of sound and offering it to the listeners, with a gleefully childish little shake of his baton – utterly charming! The end of the first movement was memorable for a perfect accelerando built up from the rich earth of the cellos; the gesture had real grit, a welcome departure from the slick veneer of Friday! The largo was exquisitely hushed, a true exhibition of Gautier’s lyricism and depth of tone; utterly tasteful and subtle slides made a compelling argument for their use in this repertoire. Thibaudet rendered his simple figurations in accompaniment of clarinet and orchestra with perhaps a little too much “artistry”, but one can easily overlook such luxurious problems. Nelsons hides his baton and conducts with his fingers for more intimacy, frequently flashing an ecstatic smile, leaning right back on the balustrade as he encourages the players to wash over him with sound. The ensuing Rondo all Polacca tempers hearty ‘folksy’ sunshine with supreme artistry, reminiscent of Haydn’s similar deployments; with Nelsons at the podium, we had that rare impression of genuine naturalness. The BSO served a perfect canvas one which the soloists could paint with vibrant, vivid strokes; the solos exuded joy and a delight in facility; coordination with the orchestra was utterly exact, as if everyone was in on the fun. Nelsons threw his arms to the heavens at the mighty G7 chord! Thibaudet achieved a striking effect by leaving his short sharp final chords ringing faintly between the big orchestra chords; it seemed a bold, arresting move but the first edition is, surprisingly, marked ‘ped.’—the effect must have been much like Beethoven’s early pedal mechanism. Though thoroughly alive, there was a sense of informed performance practice about the reading. Yo Yo Ma, who was sitting a few rows ahead, looked very happy indeed, a most reassuring seal of Tanglewood success! Rapturous applause ensued: all who could stood, and the soloists returned to the stage a number of times, clearly delighting in their mutual success. After the playful sunshine of the first half, the audience settled in expectation of the shade of Shostakovich’s Tenth Symphony. This performance marked the release of the first of the BSO’s recordings with Deutsche Grammophon, which will feature live recordings of the Fifth to Tenth Symphonies, the famous Passacaglia from Lady Macbeth of Mtsensk, and the incidental music for King Lear and Hamlet. The Tenth Symphony was written at a fulcrum in Soviet music, premiering in December of 1953 after Stalin’s death in March. Shostakovich, following an official statement of disapproval of Lady Macbeth of Mtsensk almost 20 years earlier, had been composing in secret, radically altering his style in pieces intended for ‘public’ consumption; one can only imagine the effects of this kind of repression and persecution. Stalin’s death implied liberty enough for Shostakovich to undertake his Tenth Symphony, which was received as an essay in the value of the individual and in subjective emotion and expression, after an era when the personal and private domains were suborned to the state; the frequent recurrence of Shostakovich’s signature DSCH figuration might be seen as a figurative resurrection and proclamation of the composer’s authentic voice. The work implies latent hopefulness and a renewed sense of purpose, emotions which were most vividly communicated by the BSO’s atmospherically impressive and deeply humane interpretation. The account of the symphony was deeply moving, with compelling narrative pace, celebrating the score on its own terms. For many, enthusiasm for Shostakovich is not easy to gather; Robin Holloway in On Music, characterizes the string quartets disparagingly: “[It is] astonishing that this cycle is now routinely compared to Beethoven’s; like comparing a housing estate to the Acropolis.” Nelsons occupies this prefabricated breeze-block bungalow with love, as if he were truly at home—he occupies the space of his interpretation with conviction. You could see him reveling in the terse, awkward resolutions in the counterpoint; the gestural climaxes were genuinely exhilarating, paced with merciless restraint and intensity. A particular highlight was the compelling horror of the second movement. It was good to hear the BSO play at genuine full throttle, with chokingly thick insistence. The strings were impressively arrayed with utter precision and discipline, yet with almost maniacal urgency. The seriousness and stark austerity that Nelson’s brought to Shostakovich’s famous counterpoint reminded one of Bach. In other performances, such an ascetic material can imply impersonality and dispassion. The BSO avoided froideur by creating glimmers of humor and warm musical dialogue; for example, there was a memorably cordial moment in the third movement when tutti pizzicato in the Bass section stands against a melee of motion in the rest of the orchestra—Nelsons chose to direct it with utter attention, which drew a smile from the players, who exuded appreciation. 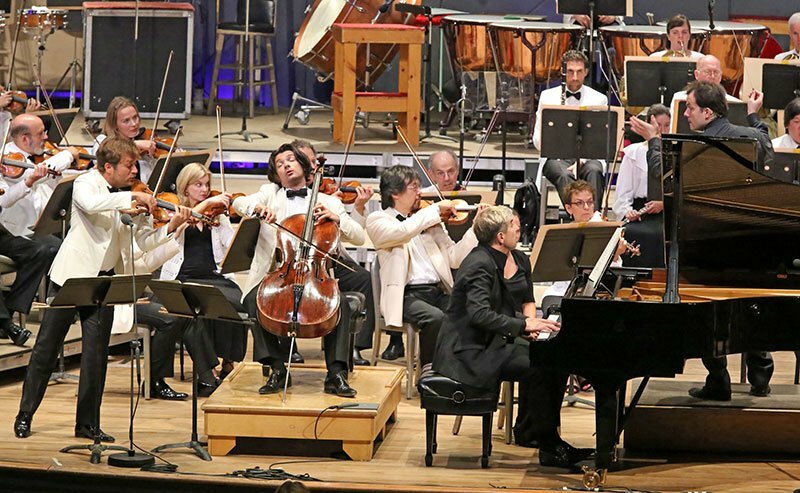 This was typical of the performance; Nelsons acts as a host, reducing the gap between players and the masses, and setting all at ease—he amplifies the orchestra’s performance, radiating the music into the auditorium, directing our attention where it will be most rewarded by pleasure. For the BSO and its audience, it seems that the party is only just beginning.